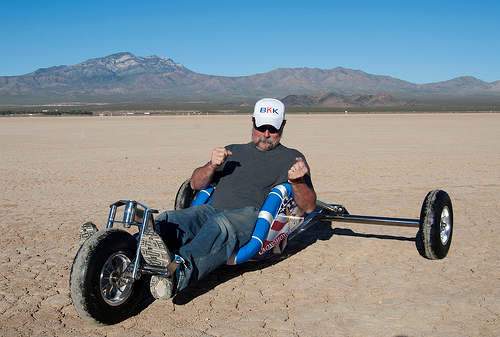 I would just like to thank everyone so far for submitting to “Inside Buggy Pilots“, but I would just like to high light one I received today from Jeff Earl aka bigkidkites, not many people will know him outside the USA, but I have had the pleasure of meeting him twice, both times at NABX. Jeff has been in this sport longer than most of us have been breathing, and there are hardly any 1,2,3,4 or 5 line kites that this guy has not flown during his life. Aound two years ago Jeff was involved in a freak buggy accident, and recently on PKF Forum he shared what has been happening to him since the accident. This entry was posted on Friday, June 1st, 2012 at 9:08 am. It is filed under Accident, General, Inside Buggy Pilots, Miscellaneous, NABX, Neighbours, Who's Who and tagged with bigkid, bigkidkites, Jeff Earl. You can follow any responses to this entry through the RSS 2.0 feed.